Funnel X ROI states that it is an automated system that can bring in $300 a day. This sounds like a system anyone would want if they were looking for ways to make money online. But is it really a system you can trust? Is it a system you can use and just what is Funnel X ROI? 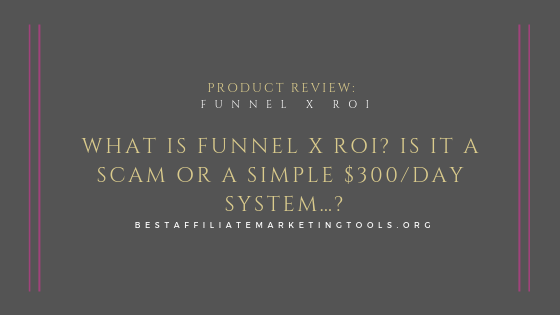 The main question, most will be asking is “Is the Funnel X ROI System a Scam…?” As is the way with most of these products, the information is quite misleading, and we want to ensure you get the full picture of this product and whether it is worth your while. You need to be mindful of any sort of funnel, as they tend to start free but end up leading you into high-ticket products that are the real bait behind the funnel. Let’s see if Funnel X ROI is any different. What Exactly is Funnel X ROI? How Does Funnel X ROI Work? Will You Make Money with Funnel X ROI? My Honest Opinion of Funnel X ROI – Is Funnel X ROI a Scam? This “free” system is designed to get you to buy into some MLM products including Easy 1 Up and Now Lifestyle. I think his claims of earnings are unrealistic and beginners could be drawn into these sales funnels without the knowledge or experience to make it work. If you are looking for genuine ways of earning money online, would benefit from staying away from this product. Funnel X ROI is a funnel system, that was put together by David Dekel. His claims are around this system generating $300 a day. Whilst stating that it could earn more than this. David also claims that you could use this system and have the potential to make your “first $100” quickly… Even today! He goes onto mention the fact you do not need any experience and can get started for free. This is all sounds great at this point (to the unsuspecting eye) and the funnel is done for you, all you have to do is “plug” it in. He provides step-by-step guides to get you going and double your income without doing any extra work. He states you are getting all of his hard work for free, and you can make a ton of money with this system. Which he claims he will be charging $1997 for, when he gets enough testimonials. Now at this point, you are expecting a free system that can generate you $300/ day with little or no work and no investment, right? 1.Easy 1 Up – this is a high-ticket recruitment scheme. You earn commission by recruiting new people to sign up with Easy 1 Up. You are provided with premade sales funnels, market material and training to facilitate this. Prices range from $25 to $1000. 2. Now Lifestyle Account – This is a health and fitness MLM company, again focusing on recruitment. So, whilst the niche is health and fitness, you will be focusing on recruiting people. 3. ClickMagick – You are pushed into buying this analytics program to help you analyse your traffic and conversions. You could find better products to do this, but this sales funnel is more about you earning commission by getting people to buy ClickMagick. 4. Funnel X Advance – The last pushed product will be another product by David Dekel called Funnel X Advance. This is a pay per lead high-ticket item and looks like the real focus of the sales funnel you are told is free. The main point is the system that you signed up for that states it is free, and you can earn $300 a day from is actually a front to get you to buy into these 4 products and that is how you can really make the money. By promoting this funnel to others. You will not make any money with this funnel, unless you buy into these 4 products. That is something I consider to be underhand. By claiming you can earn money, with a free product and yet you have to buy into other products. All, which have an emphasis on recruitment and does not work for everyone. I find that a key reason why I would not recommend this to someone just starting out. Affiliate Marketing within a niche you want to start out in, is a much better way to earn money online and at least you will know what you are getting into. Products that are not entirely honest, tend to get found out and reinvent themselves. Anyone who has noticed a similarity to Funnel X Project will notice that the funnel is pretty much the same, with the only difference being the products being MCA, Moneyline, Aweber and ClickMagick. This being a program all about email marketing funnels. Personally, I feel David is very misleading in his sales video. He states he was making $18,000 by the fourth month. Whilst I think it is possible to earn some money from these programs, he overstates the money you can earn and understates the amount of work needed to make these sales funnels work. MLM schemes are all about the guys at the top making the money. They have climbed the ladder, hence are in a better position to earn money. But many MLM schemes penalise their affiliates if they are on lower rungs. By this, I mean that you have a number of different level products in them. If someone buys into a product that is the same level as you, you will earn the referral commission. But if someone buys into a higher-level product than you, typically you will not earn the referral commission. So, unless you are willing to buy into the highest-level product within each of these programs you will be missing out on sales. Being at the top is key to actually making these types of program work and typically beginners will not be able to get to the top easily. I think you could make money from this, but it will not be as quick as David states and you will need to invest some money too. Whilst I do not think it is a scam, I do think it is a front to push you into these other high-ticket MLM schemes where you will be focused on one thing. Recruiting new members. Now, that isn’t necessarily the problem with this system, but most that would fall into this funnel are complete beginners without the experience or knowledge to actually make the funnels work. If you know how to promote these funnels, you could have a lot more success with your own affiliate marketing business and you can promote what you want to promote and not be stuck with MLM schemes that get a lot of bad press. I also question whether this has a future? The reason I say this is, there must be a reason why they stopped promoting MCA to change it up and move over to Easy 1 Up. I also, see Easy 1 Up needing to be careful, as it is a very similar recruitment scheme to MOBE and Digital Altitude. Both of which have been closed down by the FTC recently, as they have both been classed as scams. If you compare Digital Altitude to Funnel X ROI, DA was closed down due to the owner stating that you could earn thousands in 90 days. This was found to be totally unrealistic. Funnel X ROI, states that you could be earning $100 a day from day one… again, totally unrealistic. I would not recommend this if you are looking for a genuine way to start making money online, there are better alternatives. If you are looking for a way to earn money online and are a beginner, I would not recommend this type of sales funnel to you. Whilst the right marketer could make money form this system, it is something of a risk for you to take. The reason I say this is it is quite a deceptive product, starting out free only to start telling you to invest in other products. Also, “done for you” systems are never really a good idea. You never learn enough from them to be able to expand into your own online business and as you are totally reliant on them, as soon as they are gone you have nothing to show for it. These types of funnel system do not hang around that long, as they are promoting scam products or products that the FTC have an eye on. But, if you are looking for a genuine way of earning money online, without having to promote products like these you can start your own online business choosing a niche that you want to promote. Our preferred method is Affiliate Marketing, it is a great way to earn money online and means you get to start out with something you love. Check out my guide on How Does Affiliate Marketing work to understand how you can build your own profitable online business. Thank you for this honest and unbiased review of the funnel X round. I think the $300 per day profit is close to impossible and not real. I have been a victim of so many online schemes and I can categorically tell you that this is more of a scam and I won’t advice anyone to venture into it. it is unrealistic to expect that kind of return so quickly and with so little investment. I have heard about Funnel X Roi but haven’t read much into it. I am glad I have found your review first, that way I won’t waste my time on them. At first glance it seems to be a great opportunity with the free sales funnel. But it ended up just a self promoting product that leads you to promoting other products. Something doesn’t sound right here really. Thank you for exposing this scheme! we try to share with people as many of these products as we can to help people know the full truth. I agree that this isn’t a scam, however I do believe it’s a man who we’ll just call David looking to make some quick cash from unsuspecting newbies to this field. While I do respect the fact that he at least put a legitimate product on the market, it’s one that is lacking in so many key areas, starting with the claim that users will make money without investing a dime. While this might be possible, it’s also rare. Just ask any honest businessman. Overall I liked and agree with your review. What we can all take from products such as this is if they claim you can make money with zero investment or can cut corners to make money, it’s not a good product no matter how legitimate. the claim about making money without spending anything is unfounded though. you will need to buy the products and then invest in paid ads, as that is how Easy 1Up works. it is just to get you to part with your money, and no real care about whether you earn anything or not. Nice and precise article on the funnel x roi program. I do not like MLM programs because the program may have become choked and you’ll be left with struggling for crumps at the bottom of the food chain. It’s good you did not recommend this program because your seemingly work for the advantage of others. You need to market it right with MLM and be willing to invest money into advertising to get a return, as they do not tend to focus on SEO routes. This is why they tend to tell you you can earn quickly. But the experienced marketer will tell you that getting Paid ads right is a bit of a balancing act and can cost you a lot of money before you get it right. That is why I do not support MLM for a beginner. Thanks for your review of Funnel X ROI and I am glad that you have been very specific about it. I have read in the last of couple months quite a bit about this MLM program and I really have not a very good feeling about it at all. I know you are Not Recommending it and you are saying it might be not a scam. However, I do still think it is a sort of scam using people’s inexperience to make money off them, but also in return, the person seems not to get the money, they thought they can make. I know, I might be biased here since I, once, was badly burnt with a scheme something similar to Funnel X RIO. However, I am grateful for your review on the matter because I know it will help people to make up their minds and the right decision. you are right they are playing on the fact inexperienced people will think that it is reasonable to expect those earnings straight away. They will only find out once they have handed over the money, that it is not the right program for them. Hopefully, I have helped people understand what they are signing up for, if they do decide to go for it. Thank you for this informative review. I really appreciate it. Recently, I came across many different programs and sales funnels. Most of them are from Click Bank and are very low quality. They usually promise very big money for small purchase. From my experience, programs like these are scams. And I believe X ROI is no different. Thank you for exposing them and saving people from entering this MLM scheme. thanks for checking out my review. There are definitely aspects that put it in the ‘close to scam’ range. MLM is technically not a scam, but the techniques they try to draw you in, are not always honest. that is the problem. Funnel X ROI lost me when I found out they are an MLM company. Aside from the far fetched claims and underrated work load not to mention the dishonest marketing and crazy upsells they do not really provide you with any skills to thrive in the digital space. A good programme is one that fives you skills that can be improved upon and one that doesn’t make you dependent on them to ensure you have a business. A great programme is one that gets you to sign up because they offer the best training and services. Are there any other good programmes out there besides Wealthy Affiliate? I mean any programme teaching skills or techniques to make money that is not about affiliate marketing? I ask because WA definitely has affiliate marketing covered perfectly. I am glad you shared this information with us to help us avoid the trouble! thanks for checking out my review and adding some good points about the Funnel X ROI program. There are other ways to earn online, for example We use a combination of our own products, drop shipping and affiliate marketing on Gem’s wedding stationary website. But i learned everything I needed from Wealthy Affiliate. On the face of it, you might think WA is all about affiliate marketing. but any aspect of an online business is covered within WA. Kyle and Carson (the owners) know their stuff and share it and anyone with an online presence or wants one will benefit from the training. I wouldn’t think it necessary to go anywhere else to learn anything. When I first started looking out for ways to make money online, I fell for a scam to do with binary option trading. All the signs i tell people to watch out for now, have come from that experience with that scam. A system that does it on auto-pilot, done for you, sit back and watch the money come back. Yeah, it was a bad experience, but luckily I did not lose any more than i could afford. But I also made it my mission to help others only find genuine opportunities and to highlight programs that weren’t their friends and those that were. It is a steep learning curve, when you first get stung by these scams. But then again, without that experience I would not have found Wealthy Affiliate and started my own genuine online business. Working online myself, I often come across web pages such as this system you have reviewed here. Though I’ve never heard of Funnel X ROI before, I’m glad to have seen your review first. Usually, it is just a matter of time before falling upon a page that pops up with information on how to “get rich quick.” This definitely appears worthy of the category. Really, the reason that I wanted to comment here is that I see that your “#1 recommended product” is Wealthy Affiliate. I am a member myself, and have no future plans to change that status. WA has great training for those looking to get started in any online business, with easy-to-follow steps, support, and furthermore takes care of all of your hosting needs. So even if you already have a website, you can improve upon important factors such as getting more traffic to that site through the use of WA. Glad to see it as your top recommended training system! thanks for checking out my review. I absolutely love what Wealthy Affiliate offers to its members and those looking for a genuine route to an online business. So it is only natural to say it is our top recommended product. I have not seen any training program that comes close to it, and I am glad you agree with that assessment. Lovely article you got here! I was first astonished when i saw the title. Was really anxious to read about the post when i saw simple $300 per day system (smiles). After reading through on your post I realized that the four upsells (Easy 1 Up , Now Lifestyle Account , ClickMagick, Funnel X Advance) in summary still requires efforts in recruiting/referring new people which could be very demanding. So i would still gladly prefer affiliate marketing to this Funnel X Project also has you have suggested. Funnel X Project is purely an MLM scheme, which only favors those at the top level. Thanks so much for this post. I would be glad if you could make some good posts subsequently on how a beginner can earn from Affiliate marketing. Yeah, their promotion of the product focuses on the emotion over being able to earn easy money. but in reality, they just want to you to spend your money instead. These MLM programs require just as much work as anything else does to earn money. But there is no freedom in the what you choose to promote. They are all about self promotion, rather than letting you choose what you promote. That is why I prefer Affiliate Marketing. What is Affiliate Marketing for Dummies? thanks for checking out my post. Whilst Funnel X ROI is free, the upsells are really expensive and if you do not know what you are doing, you can never get off the bottom rung of the ladder. MLM is something I personally avoid for that reason. I will only promote products I truly believe in, such as Wealthy Affiliate. Any product where you only promote, means you have to sell it regardless of what you think. Thank you for alerting us about Funnel X ROI. I am not fancy about Done For You Sale Funnel, especially you don’t have control over it. Further, this product has 4 high ticket upsells and l hate hidden upsell. Further, the upsell is to sign up on 4 MLM scheme which is a risky business as FTC can close these MLM company anytime. I agreed that Affiliate Marketing is still the best business model to earn passive income and l was taught by Wealthy Affiliate. thanks for checking out my post. You are right, there are plenty of things to be mindful of with this product and it has the typical signs of a product to avoid. Affiliate Marketing is a great way to get started online, Wealthy Affiliate is a great training platform and is our No.1 Recommended product. see why, in our review.